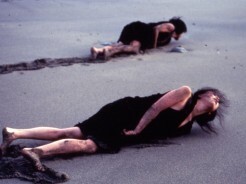 As part of Danspace Project's Platform, Anthology Film Archives welcomes Eiko as guest-curator of a film series showcasing movies that have influenced her work and that speak to her chosen theme, A Body in Places. Encompassing narrative films such as Burmese Harp, Kanal, and The Naked Island as well as several rarely-screened documentaries, the series pairs each feature film with a short work by Eiko, Eiko & Koma, or John Killacky. See PROGRAM DESCRIPTION. Eiko will introduce films at all screenings. The BODY IN PLACES film series is co-presented by Danspace Project and Anthology Film Archives, and co-organized by The Japan Foundation. Eiko is grateful for the assistance of Alexis Moh throughout the planning and presentation of the Platform. Special thanks as well to Lydia Bell and Judy Hussie-Taylor (Danspace Project) and to Kanako Shirasaki (Japan Foundation).